Outdoor cooking is one of life’s simple pleasures. But there comes a time when a rusty barbecue on a slab of concrete just isn’t going to cut it. Outdoor cooking can be done with beauty, elegance and convenience. If you are ready to upgrade your outdoor cooking experience, the time to get started on planning your perfect outdoor kitchen is now. Contractors are scheduling projects late into the summer as we write this. If you wait too long, you might find that another peak grilling season could be lost before you get your new space in order. A Memphis Wood Fire Grill is the starting point for any successful outdoor cooking solution. Memphis offers a range of options to meet your grilling, smoking, searing and convection baking needs. 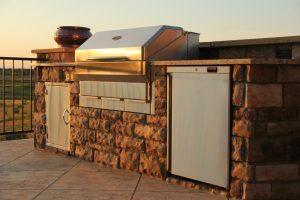 Choosing among the Memphis Advantage, Advantage Plus, Memphis Pro and Memphis Elite grills requires careful thought and an understanding of how you plan to use your grill in the years to come. Selecting the right cart model is just the start, however. There is more to consider. Our new stainless steel drawers and doors provide a variety of options that can be seamlessly blended in your masonry island. Like our grills, our accessories are built in the USA using high quality 304 Stainless Steel. They are designed and built to allow for year-round use. We have numerous options, allowing you to craft the perfect solution for your space and grilling needs. 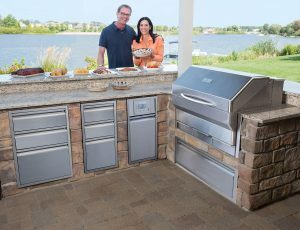 The right solution will help you truly enjoy your grilling experience, without the need to endlessly go back and forth between your indoor and outdoor kitchens. Wood pellet grilling has been around for some time. While it has only recently begun to replace the charcoal and propane grills that were once all the rage, the basic idea of wood pellet grills isn’t new. But what makes our grills stand out is that we’ve refined and perfected the wood pellet grill into the elegant solution that takes your outdoor cooking to new heights. Having an outdoor kitchen you can be proud of can truly change your life. Get-togethers with friends, neighbors and family members take on an entirely different feel when you have a space built to your specifications. The time to get the outdoor cooking solution you deserve is now. If you have questions about our grills or about how our products can fit into your outdoor cooking vision, visit a Memphis location near you or contact us today.